All Creatures Sanctuary (registered 501(c)3) has taken on a HUGE liability by helping to rescue hundreds of Las Vegas Dumpsite Bunnies. They currently spend over a $1000 in food & supplies each month to care for them as we adopt them out. Our goal is to get 200 people to donate just $5 a month, less than ONE CUP of Starbucks each month. Of course you can alway donate more each month if you wish!!! WHILE THE CAPTURING IS DONE, THE CARE AND REHOMING IS STILL GOING ON. DUE TO THE COMPLETION OF THIS RESCUE EFFORT, THIS VEGAS BUNNY DUMPSITE IS NO LONGER A BUNNY DUMPSITE! UNFORTUNATELY, THIS NOW MAKES FLOYD LAMB PARK IN THE CITY OF LAS VEGAS THE LARGEST BUNNY DUMPSITE IN TOWN. AS OF MARCH OF 2019, OUR GROUP IS HELPING TO COMPLETE TNR TO STOP FURTHER BREEDING OF THE BUNNIES. IF YOU CAN’T DONATE, PLEASE SHARE!!! 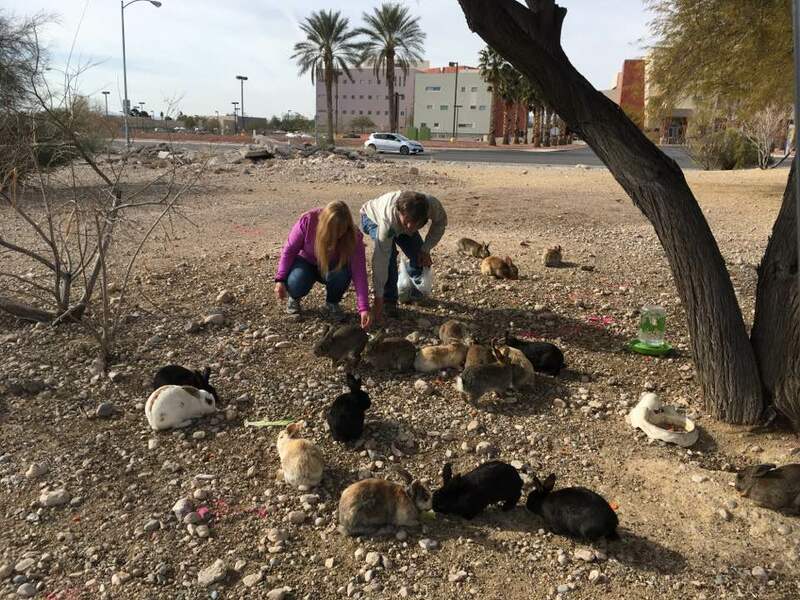 There is a central location in Las Vegas where people have dumped their unwanted pet bunnies at a large State mental health facility because there are already hundreds of “wild” domestic bunnies running around at this site. These bunny dumpers probably figure “Hey, what’s one more bunny there? They’ll be happy here!” The problem with that is that bunnies are very territorial and if you haven’t ever seen bunnies fight, it is more brutal than you can imagine. 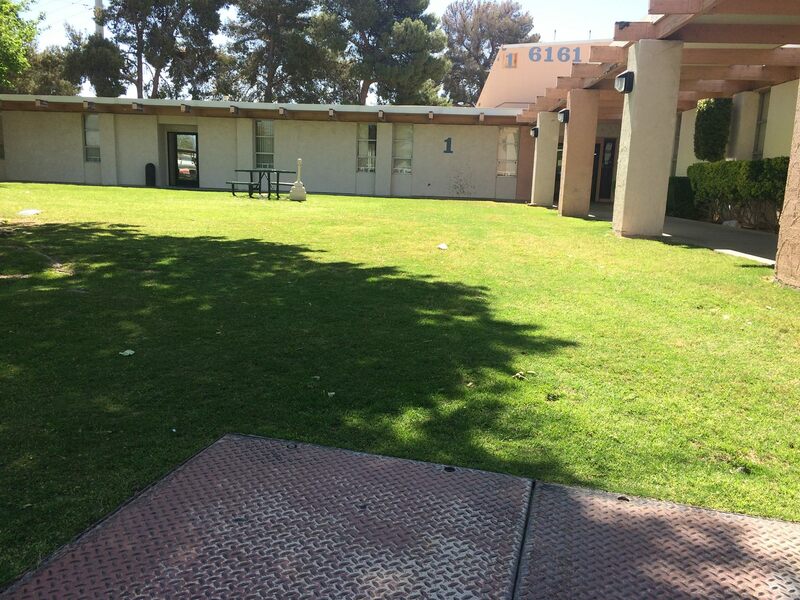 The new bunnies that are dumped here will be attacked by the other bunnies (Caution Graphic Post), suffer heat stroke, be hurt other animals (coyotes and hawks) and/or run out in the street and get hit by cars because they are being chased. There are also cruel people who maliciously try to hurt or kill the bunnies at the site as well. 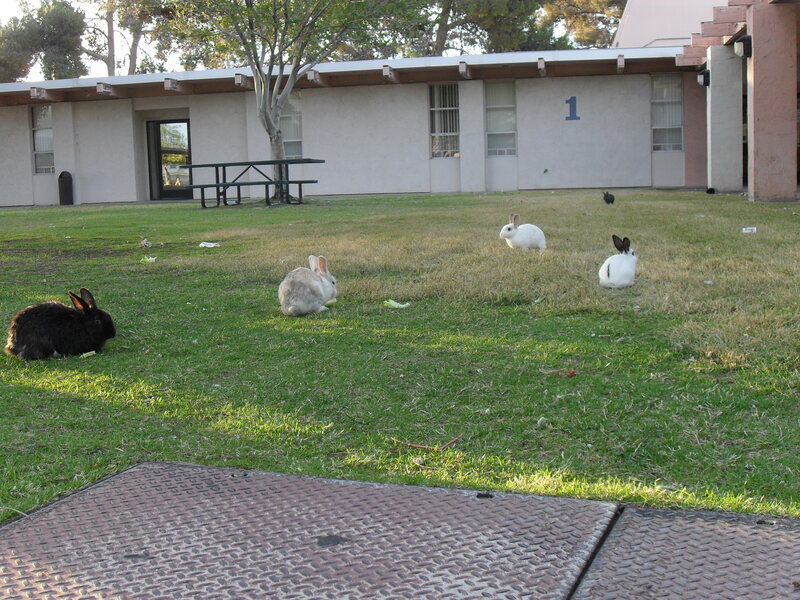 The story that we’ve heard from a few different people is that around 2007, the State thought that it would be calming for their mental patients to have bunnies running around their huge, many acre facility, so they let several bunnies loose, not spayed or neutered of course. Apparently, the State did not take into consideration that rabbits breed like rabbits. Since the bunnies at this site have never been fixed, the 100’s of female bunnies can have between 4 and 12 babies EVERY 30 DAYS and their offspring can start reproducing at 3 to 4 months old. Obviously, it doesn’t take long for the bunny population to explode and areas to start having major bunny issues as they reproduce. The ONLY reason the population is somewhat under control here is that bunnies had been constantly dying from injury (being hit by cars), local predators including humans or purposely being killed by one of the State’s entities because they are destroying their landscape. Please help by donating and/or volunteering so that we can help stop this bunny suffering from continuing. Failed Rescue at the Las Vegas Dump Site??? 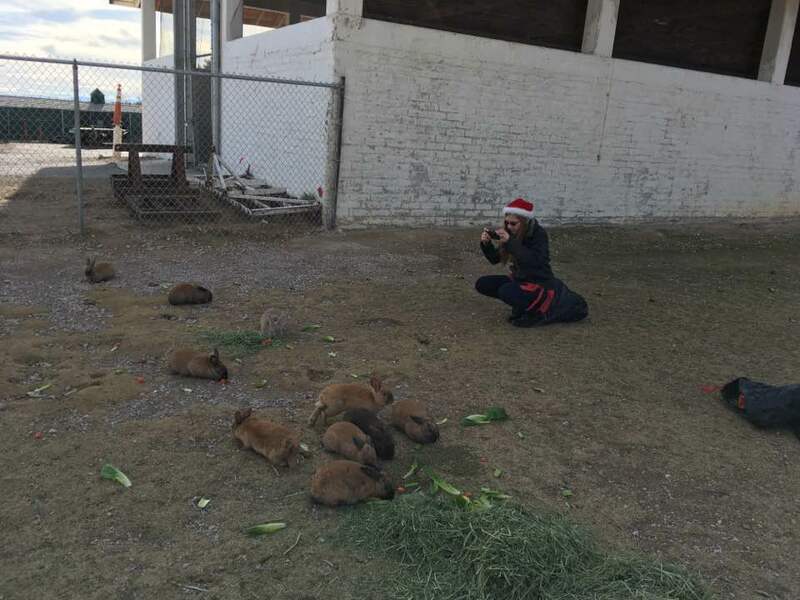 The state of Nevada had contracted a rescue called V Sanctuary (Fall 2015) to “fix” the bunny issue but according to the owner, he was not given enough funds to solve the problem (200 bunnies at $40 each I was told on the phone with him). In this Channel 13 news story on the Las Vegas bunny dump site, it states that V Sanctuary was actually paid $17,000 to try to fix this problem but whatever amount was spent, it was a complete waste of time and money. While initially the “rescue” effort got the bunny population smaller for a short period of time, since ALL the bunnies weren’t rescued and fixed, six months later (May 2016) the population was already out of control again. There is once again a huge population problem again and more bunny suffering is happening as there is usually little food or water. More dumping and bunny suffering. While there is better access to grass and water here at this City of Las Vegas park most of the year, the winter grass still turns brown and all the green plants and brush they hide in die, taking away their protection from prey. Coyotes and hawks get hungry and will come down and feed on them. Many do survive with the help of great bunny heroes like Lucy and Duncan who not only spend their own time and money to help water and feed them, but make these great fun videos to help bring awareness to this bunny disaster. These were feral bunnies in a NW Las Vegas neighborhood that made a home under my families shed and began breeding which is how my daughters and I became aware that there are little resources for bunnies here in Las Vegas. There are several neighborhoods in Las Vegas that dumped bunnies are breeding and struggling to survive. We personally have been trying to do our part in our neighborhood (Schweiger Family) and have done TNR (Trap Neuter Return) on our property to help stop the breeding in our neighborhood. Since spring 2015, some of the TNR bunnies have run away but some have been taken in and adopted most of them. The last 5 survivors of my neighborhood rescue went to Lollypop Farm in New York using the Bunderground Railroad. Unfortunately there are many other park and neighborhoods around town that we are aware of that are dumpsites for bunnies as well. During the spring and fall at the properties, there is some grass for the bunnies to eat and some water to drink from the sprinklers but the weather in Vegas is very brutal on these bunnies in the other 2 seasons and they do suffer without any outside help (and even with our outside help as they aren’t meant to survive in the extreme heat or cold ). We have found parts of bunnies, dead bunnies and some “grass roots” bunny rescuers have even had to put a few bunnies to sleep because of the severely injured or possibly poisoned bunnies they have come across. (Warning – Graphic video of baby bunny Vegas PTS on April 17, 2016). The bunny is this video was poisoned by a food deadly to bunnies but no one could prove who did the poisoning. We currently help to rescue many of the dump site bunnies that our volunteers find in distress out on site but this is very expensive. One of our favorite rescues (Matty/Lucky) cost our volunteer $1500 to vet her. 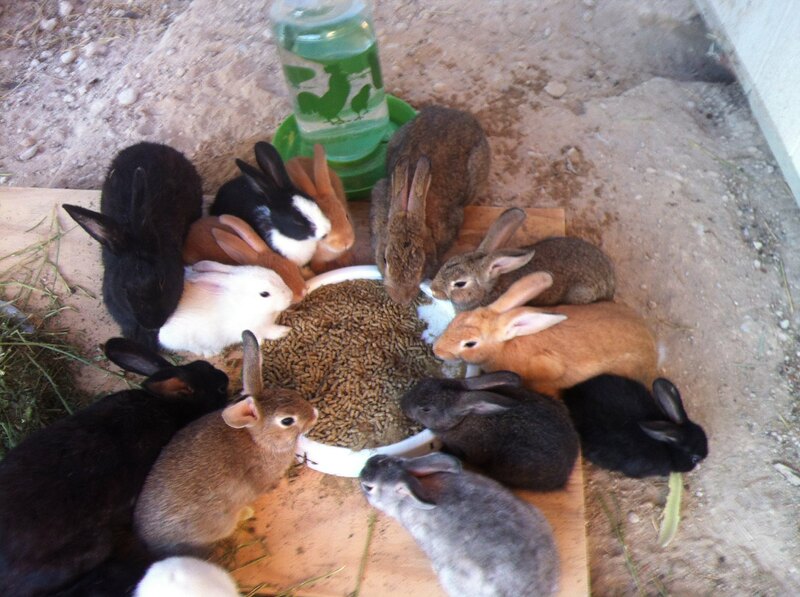 How can you help the Las Vegas Dump Site Bunnies? We currently need bunny supplies such as a x-pens, cages, litter boxes, paper litter, bunny pellets, Timothy & Alfalfa hay, etc. plus monetary donations for medicine and the actual spay and neutering fees at the different vets. We will do everything in our power to keep the costs down to a minimum so that we can keep these guys healthy as we start to spay and neuter and finally help to stop all this unnecessary bunny suffering. We also have teamed up with other rescues and other rescue people like All Creatures Sanctuary & Vegas Bunny Rescue. To donate to All Creatures Sanctuary (registered 501(c)3) who is feeding, caring and transporting the majority of the Dumpsite Bunnies, you can donate by clicking on the below link. IFA Country Store in Las Vegas will allow you to buy 50 pound bags of 16% bunny pellets (about $16 each) or wood pellets (used for litter boxes – about $7 a bag). You can call them at : (702) 837-1755. Tell them it’s for All Creatures Sanctuary. 15% Discount & Donation to Bunnies Matter in Vegas Too! Currently we are coordinating volunteers for 2 groups of people; People who wish to volunteer to feed and water the bunnies at the Floyd Lamb Park rescue and staging area and experienced bunny people who wish to help foster a bunny or two. VOLUNTEER & HELP BUNNIES BY SIGNING UP TO VOLUNTEER BELOW!